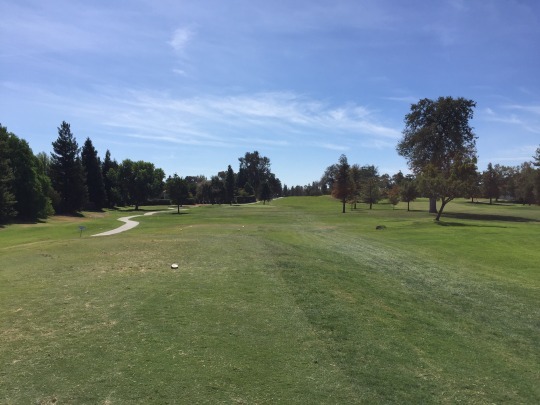 After 63 holes on Monday, I was back at it again on Tuesday with another 63 holes. The real grueling part was knowing I still had a 7-hour-or-so drive home that night! I was hoping to hit the road a bit earlier than I did, but a special circumstance came up that caused an unexpected 3-hour detour. More on that later. 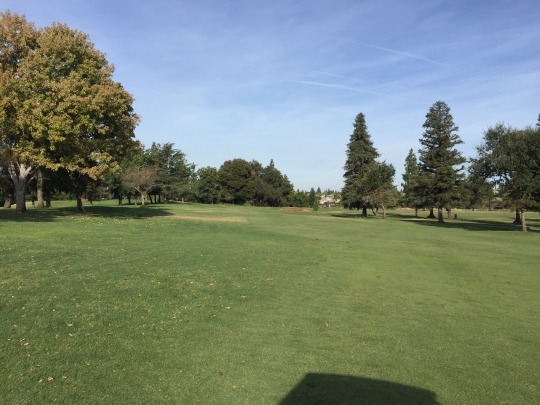 Not counting the final round I squeezed in, Tuesday was focused around the city of Roseville, which is just northeast of Sacramento. 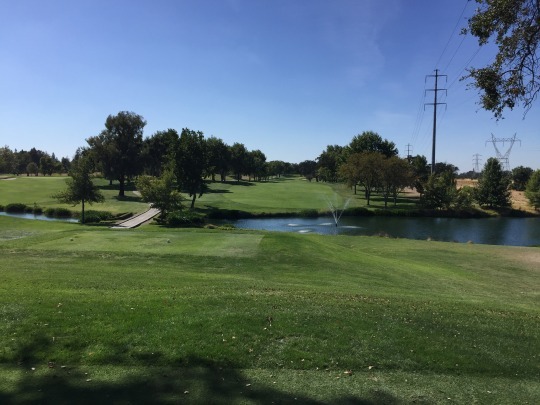 With all the courses in Roseville, Lincoln, Rocklin and then Auburn a bit further east, this is an area that is certainly loaded with golf. 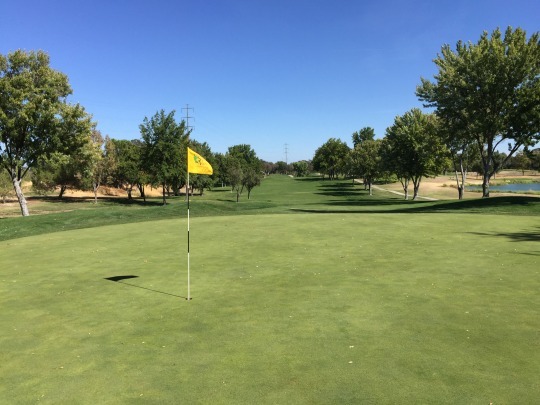 I’ve been doing pretty good in recent years to make a big dent in this part of the greater Sacramento region. 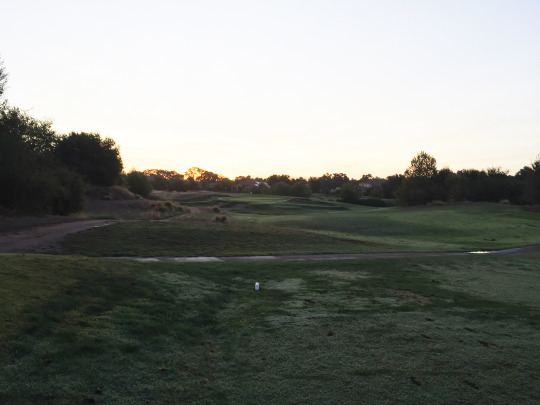 My friend and I had an early tee time and were aiming to be the first off at the crack of dawn—or maybe even a few minutes before there was enough light to see much. An older couple beat us to the first tee in the dark. The pro shop guy assured us that they were regulars who were super-fast. “Nobody ever catches them,” he says. Those words only served as a challenge to us, as we pride ourselves on playing quickly and we had another tee time to get to across town. We let them go ahead and even gave a slight head-start as I wanted at least a tiny bit of daylight to work with for pictures. Admittedly, they were very quick players and they jumped out to a good lead. By the time we got to the back nine, however, we caught up to them and started to push. They relented and finally let us play through with a handful of holes left to go. 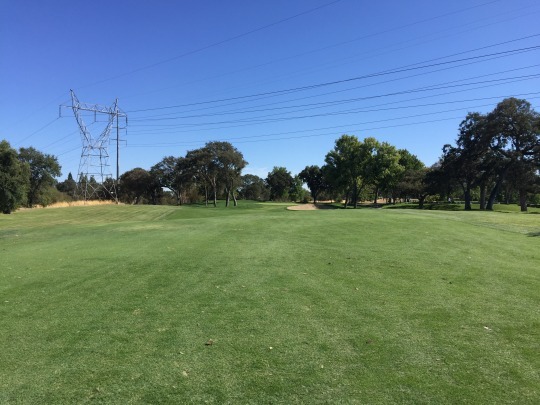 The rack price for a weekday morning round was $50, which seemed rather steep and was definitely overpriced for this course at the moment. I’ll talk about conditions in a bit, but they were fairly disappointing. It’s too bad because the course layout turned out to be one of my favorites on this entire trip. Morgan Creek used to be a private club and it’s only in recent years that it went fully public. You can tell the economy and the drought definitely took a toll on this place, which is unfortunate. 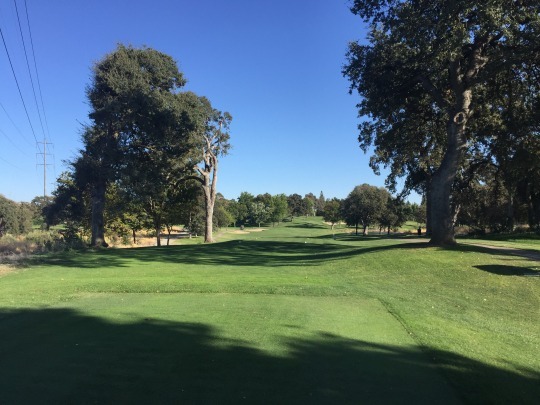 Morgan Creek was designed by Kyle Phillips, who is a modern course architect who recently came to my attention when I played the famed California Golf Club of San Francisco a couple months back. 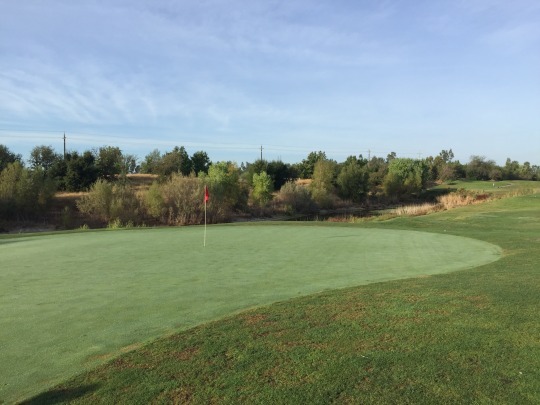 He led the most recent renovation of that great course. 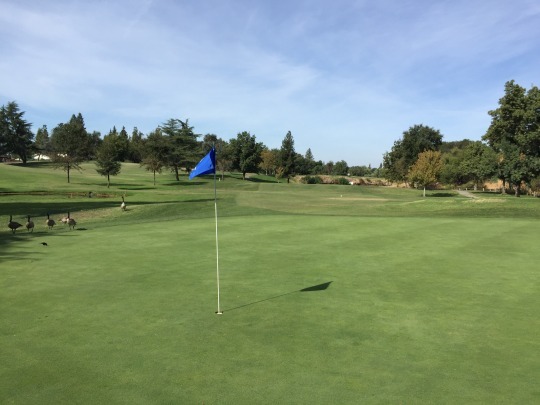 And as I did more research I found that almost all of his United States projects were renovations at high-end clubs such as Wilshire, Del Paso, Incline Village and Menlo CC. Otherwise, the majority of his courses are overseas. 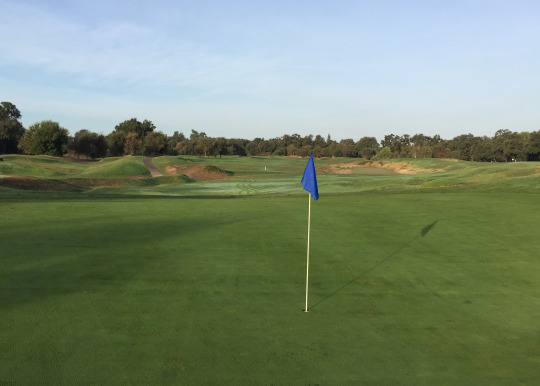 However, Morgan Creek is currently the only course in the U.S. that Phillips designed from the ground up. With that knowledge, I was certainly interested in playing it despite it being a course that really doesn’t garner a lot of attention. Well, I sure hope Mr. Phillips is able to develop more new courses in the United States. 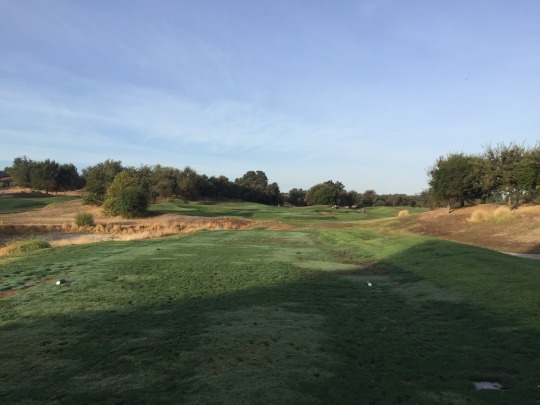 As a course layout, Morgan Creek is a gem. 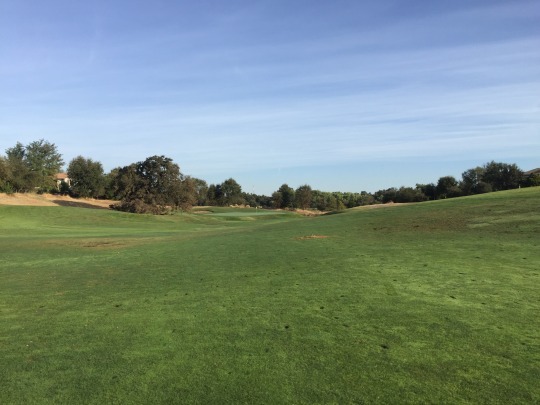 With the fairway and rough conditions being less-than-desirable, we kind of had to use our imagination a bit to visualize what this course must have looked like in its heyday (and hopefully can look like again). Phillips apparently worked for Robert Trent Jones II Design and you can definitely sense some RTJ (Junior and Senior) influences along with maybe a little Dye flair thrown in. Morgan Creek plays through a nice natural area along a creek. 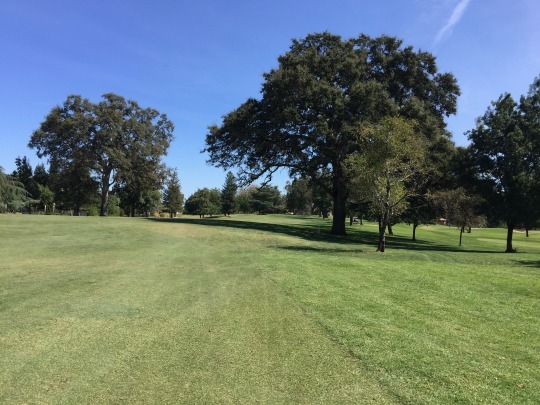 There are plenty of old oak trees in play, so the setting has a good feel and there aren’t many houses infringing on the course despite it being in the middle of a gated residential community. There really aren’t any significant changes in elevation here, but a lot of earth was moved to shape the course. 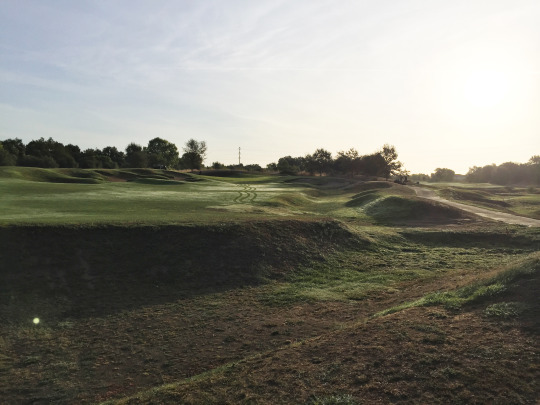 Most fairways are lined with different mounds, steps and shelves to create a visually interesting contour. 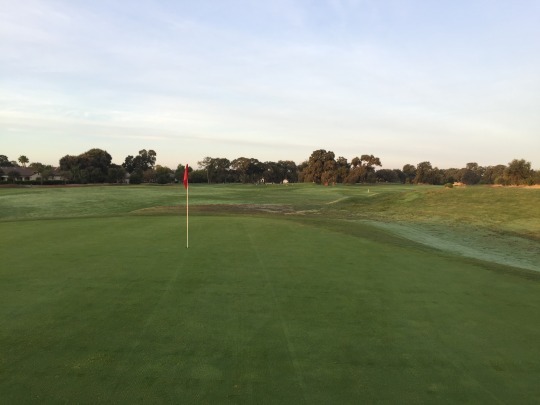 The greens are mostly elevated and also surrounded by a lot of similar undulation and some deep bunkers to add some intimidation. 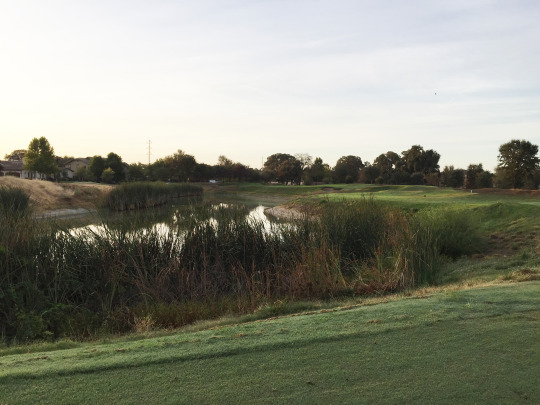 Beyond the creek that can come into play on many holes, there are other large man-made water hazards to contend with throughout the course. Some could argue the course has a bit of a “manufactured” look in places, which is often the knock against RTJ Jr. and Dye. I felt like it added a lot of character at Morgan Creek and only enhanced the nice natural setting. 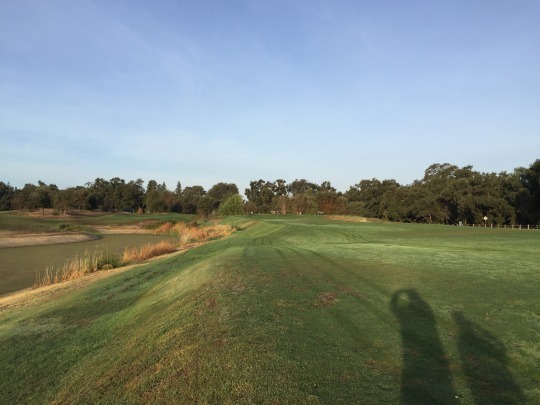 I don’t know if my pictures will really show these contours due the spotty conditions and also the lack of light for much of the front nine as we played so early. To me, the highlight holes were 10, 11 and 18, which all have a similar vibe. 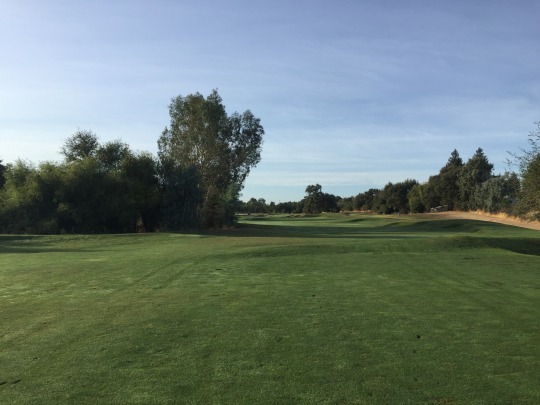 The 10th is a solid par-5 with a water hazard running the length of the hole on the left. Just off the fairway to the left is a steep slope down to the water, so you’re quite lucky if you hit over there and the ball stays up. The 11th plays straight back along that same water hazard. 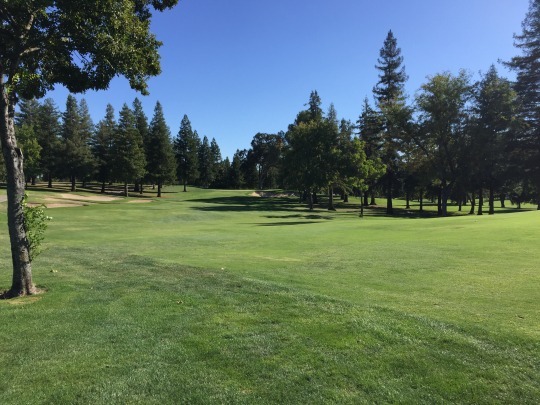 It is a long and demanding par-4. 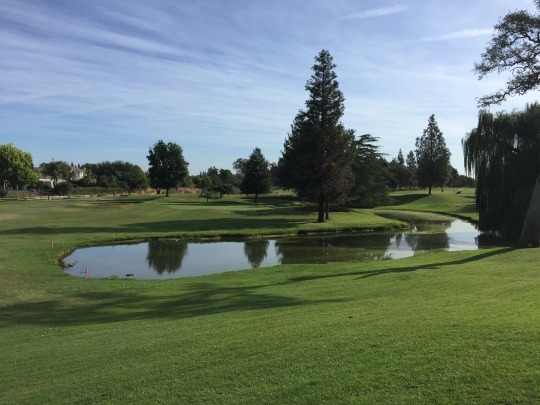 The 18th is a very strong finisher that doglegs left around a water hazard. 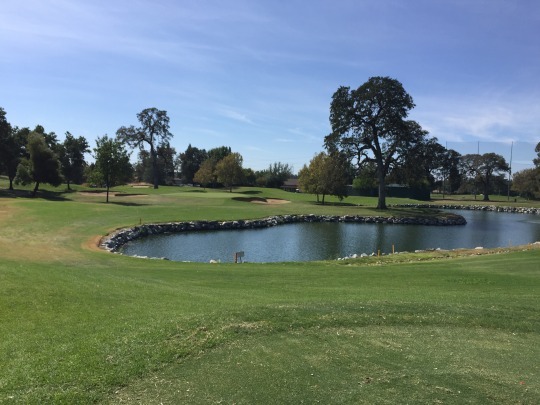 The par-3s that stick out are easily the 7th and 16th, which both play over water hazards and have well-protected greens. As mentioned, the conditions left a lot to be desired and we also battled with maintenance on the greens throughout our round. The tee boxes were flat enough to get a tee in the ground, but the ground was firm and the grass was patchy at best on most blue tees. 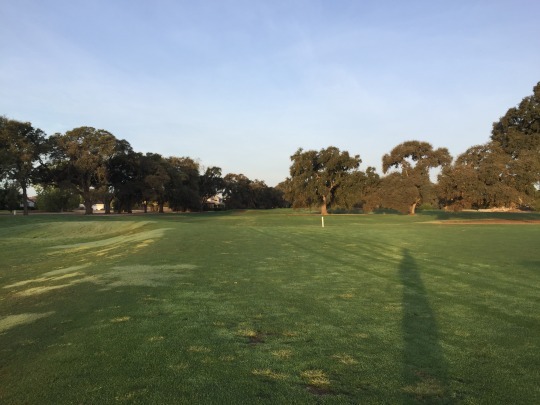 The fairways were patchy and inconsistent. There were some muddy wet spots, some really firm hardpan sections, some shaggy areas, and some thin spots. It looked decent from afar as you’ll see in pictures, but not so nice up close in most areas. The rough was more of the same, just any grass was longer. I will say the back nine was probably in slightly better shape than the front for whatever reason. They did have really nice soft bunker sand, so that was a highlight. The greens were pretty good as well, other than the amount of grass clippings left on top from the mower. We played around the guys with blowers clearing them off, so we only got a few holes that weren’t covered with clippings. 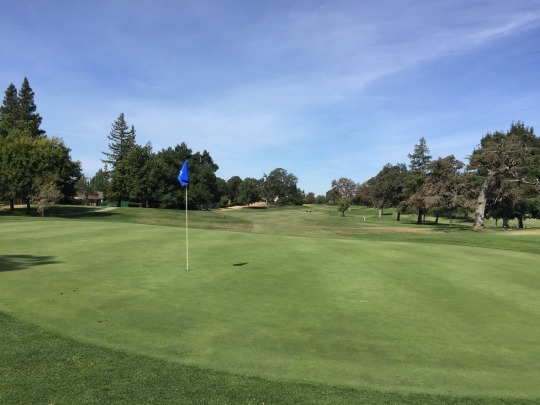 Otherwise, the greens were receptive and rolling well at medium/fast speeds, and I am sure they were much nicer for later players once the wet grass clippings were cleared off. 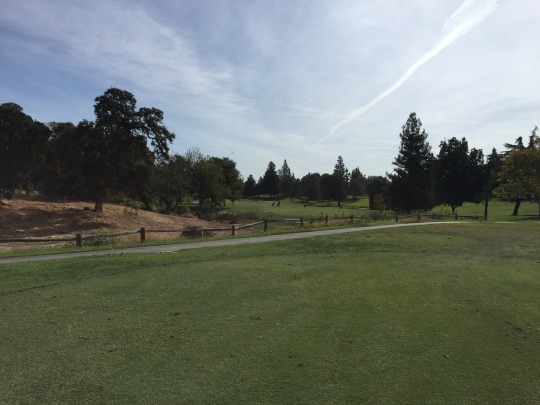 I’m mixed on whether I should recommend Morgan Creek to my fellow traveling golfers. It is a design worth checking out. I don’t know if we just caught the course in a bad time of year or if it is on a consistent downward trajectory in terms of conditioning. 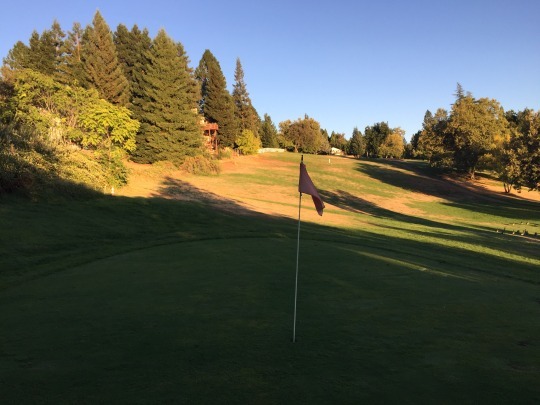 I have to say almost everywhere else we played was in very nice shape, so that doesn’t bode well for Morgan Creek. We had initially tried to play here in July, but got screwed by a “phantom” early morning tee time that we had booked but didn’t really exist. We had a Costco voucher for 2 players that we wanted to utilize. They were unable to get us out that morning and the guy in the pro shop was not the most pleasant character. They were much nicer this time around and we moved up to an 8:58 tee time after finishing so quickly at Morgan Creek. 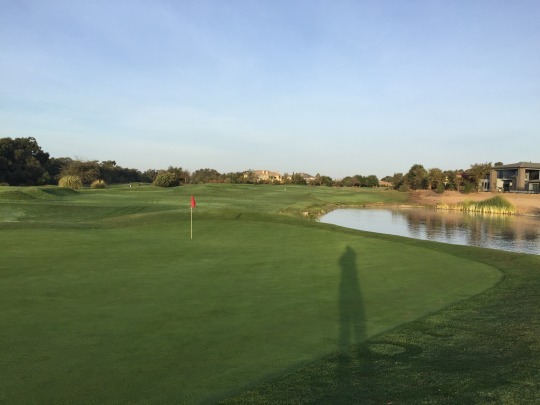 It was fairly busy at Diamond Oaks, though. We just played as a twosome behind some other groups and really didn’t have anywhere to jump ahead. However, we had nobody pushing behind us either. 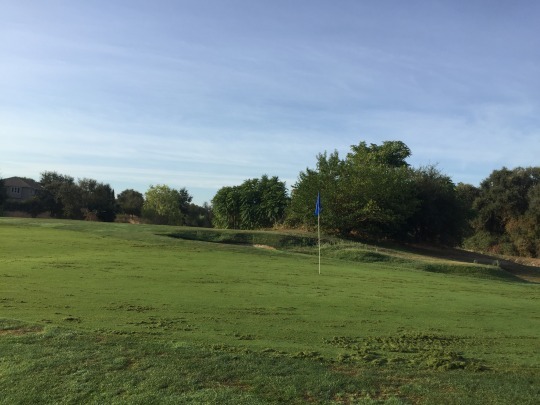 So we would just take 15-20 minute breaks every couple holes, watch TV on our phones and then play 1-2 holes at a time without having to wait in between shots. The overall pace really wasn’t that bad as we finished in about 4 hours, 20 minutes. 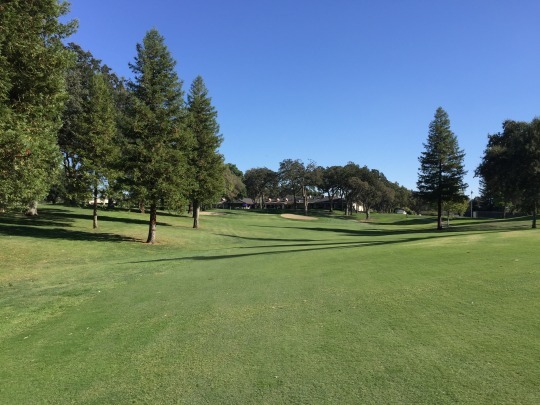 Diamond Oaks is one of this area’s older municipal courses with a pretty traditional design by Ted Robinson. The layout turned out to be more interesting than I expected though. It has some slight changes in elevation and it uses the natural terrain pretty well with plenty of trees in play. My favorite holes were the 4th, 6th and 12th. 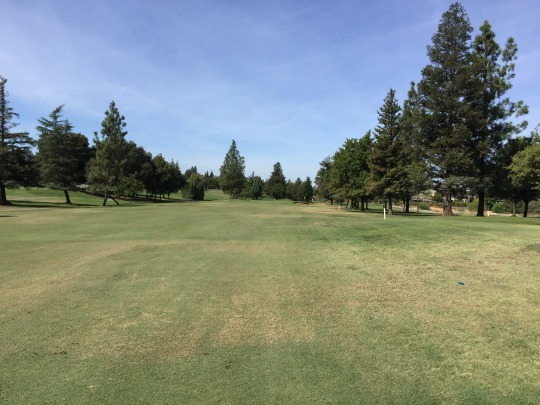 The 4th is a nice short-ish par-4 set in the back corner of the property. 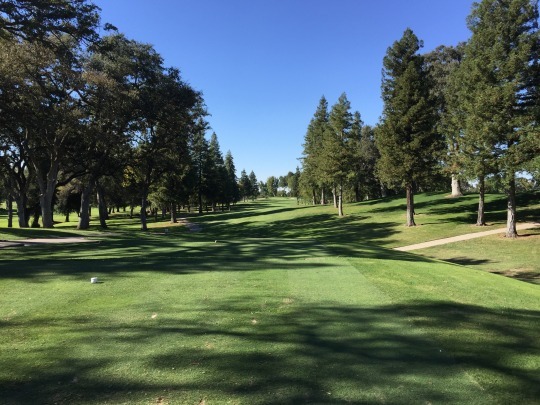 It is a dogleg right with an uphill approach. The 6th is a fun par-5 that I wish I had more local knowledge of before playing as I royally screwed up my second shot over the ravine. 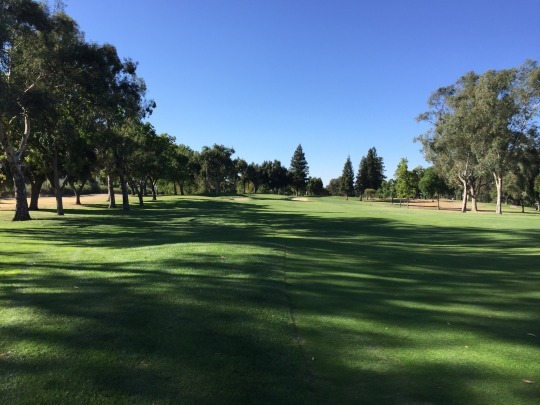 Otherwise, it is a split fairway design that will make you think on each shot. 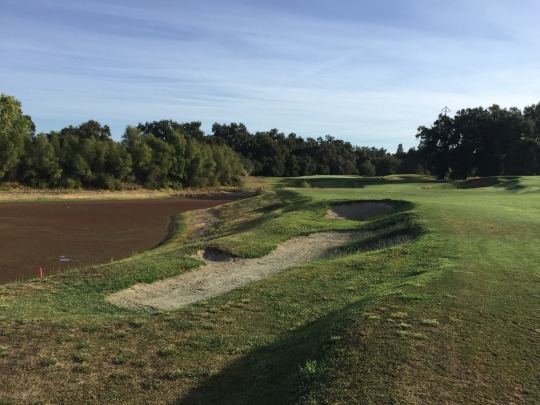 The 12th is kind of the signature par-3 over water, which you might expect on a Robinson course. No waterfalls or wood planking, though. 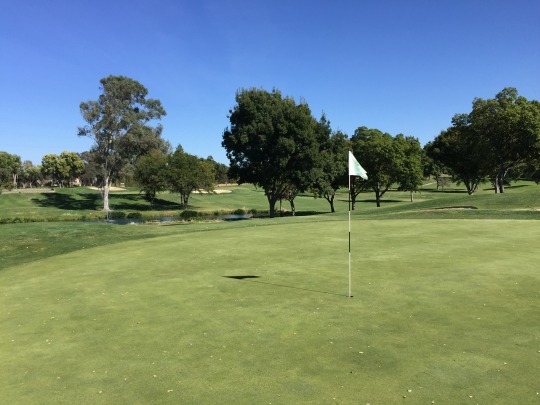 Diamond Oaks was in solid condition. Again, for a course of this caliber, nothing much to complain about. The tee boxes were fine. 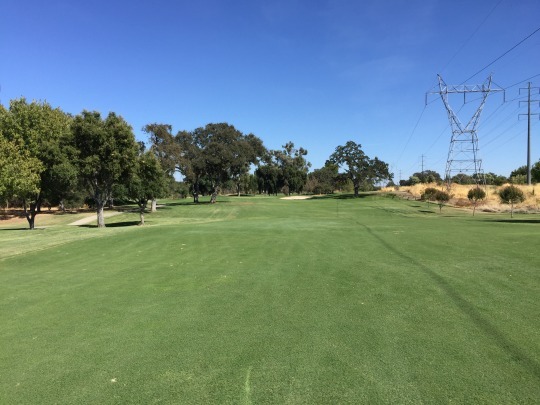 The fairways and rough were a mix of bermuda and kikuyu (more kikuyu, though), but fairly well maintained with mostly good coverage. You just had to pay attention to the lies before swinging. The bunkers were on the thin side. I found them just adequate enough while my playing partner found them to be way too firm. As was the theme for this trip, the greens here were excellent. They were receptive and rolling smooth at medium/fast speeds. 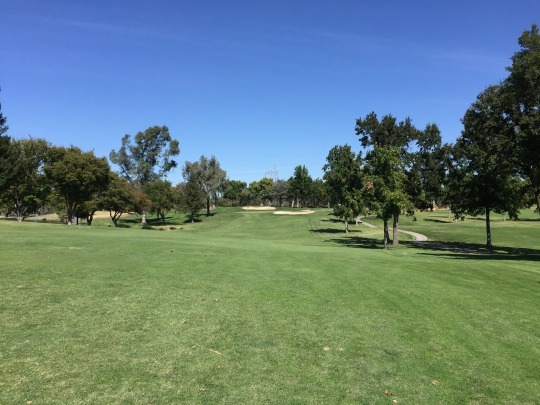 It’s easy to see why Diamond Oaks gets so much local play. 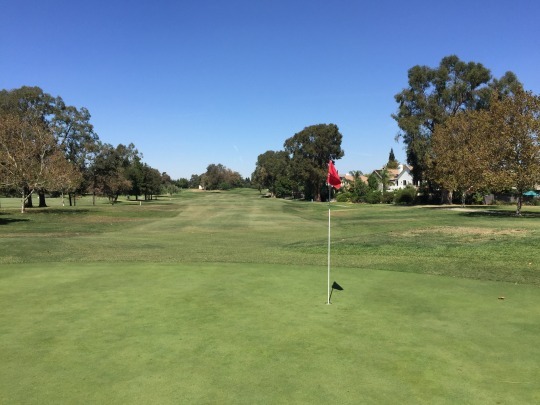 It is a solid layout with above average conditioning for a muni, and good deals are very easy to find. 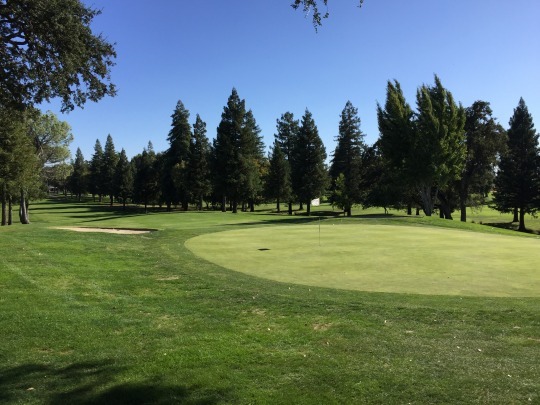 It’s not a must-play for the traveling golfer visiting the Sacramento area, but it’s good enough to enjoy a regular round. My friend has an NCGA membership and signed me up as a guest for this outing, which was supposed to be on Monday and the reason why we had the travel dates for this trip all locked in. However, there was a scheduling conflict and they had to cancel the outing somewhat last minute. 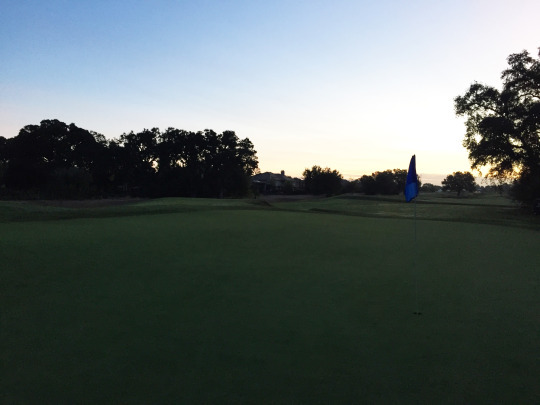 Instead, the club just opened it up to all attendees to schedule individual tee times on other days. It was cool they did that rather than cancel it altogether. It worked out well because it gave us a lot more flexibility. We loosely set up a 2:09 tee time. The registration price for guests was only $60 and it also included a free lunch. We had time to relax and eat in the clubhouse before heading to the first tee. It wasn’t super busy out, but there were enough people on the course to slow things down. And unfortunately, a lot of people jumped on the 10th tee ahead of us as we were making the turn. They were either people only playing the back nine or they had taken long breaks in between nines. After this, we had to get a little creative. We played 15-18 and then circled back to play 10-14. It was a good move and definitely saved us some time. 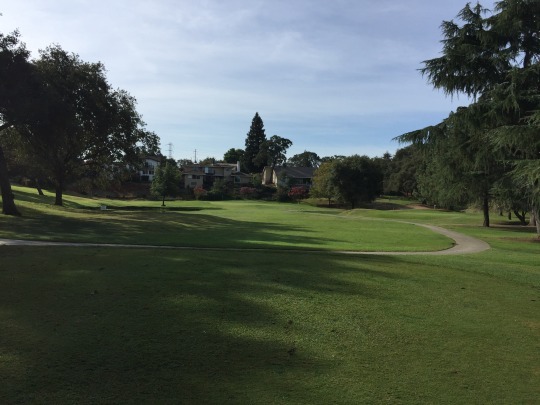 Sierra View is another somewhat older course that was originally designed by Jack Fleming, who is best known for his work on San Francisco’s municipal course collection. It definitely has a traditional vibe and a nice presentation. 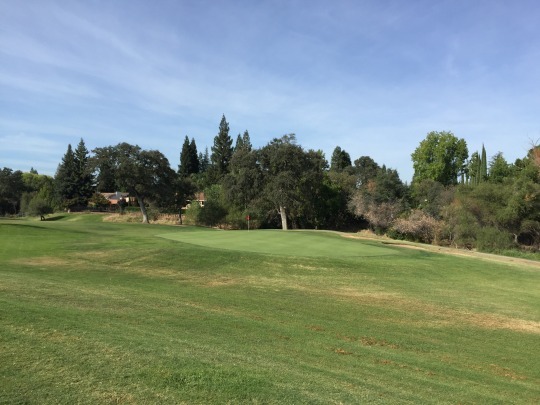 The course is rather hilly, so the changes in elevation provide a lot of natural character in addition to the mature trees lining all the fairways. 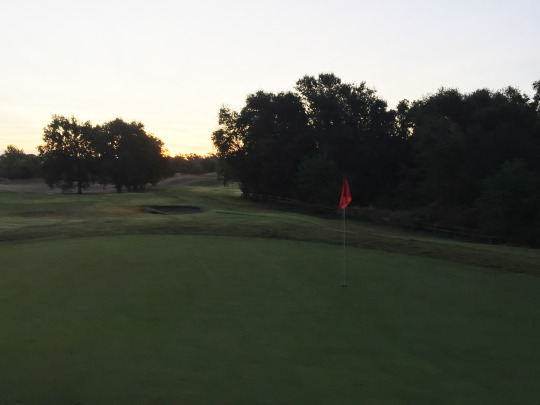 Many of the greens are elevated, but the complexes are fairly simply designed and the bunkering isn’t too intimidating. 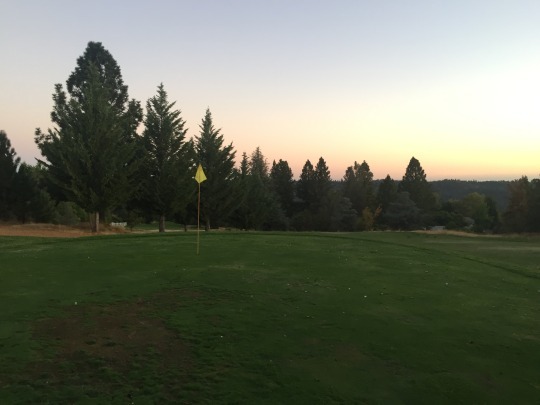 This layout is mostly about positioning yourself safely off the tee (don’t hit a tree or catch a side slope) and then you’ll have some decent scoring opportunities. The back nine is easily more memorable than the front, especially the closing stretch of 14-18. 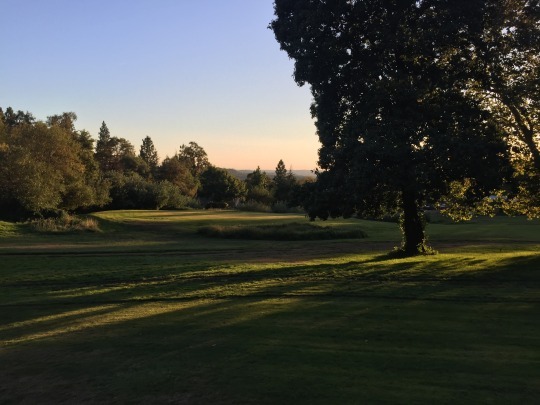 Otherwise, Sierra View has a really strong collection of par-3s. 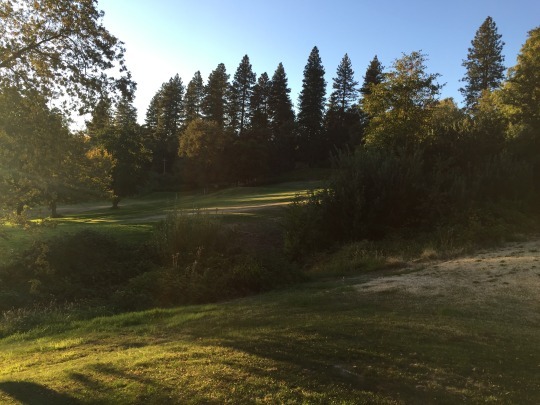 The 5th and 12th feature elevated tees hitting downhill to the greens. 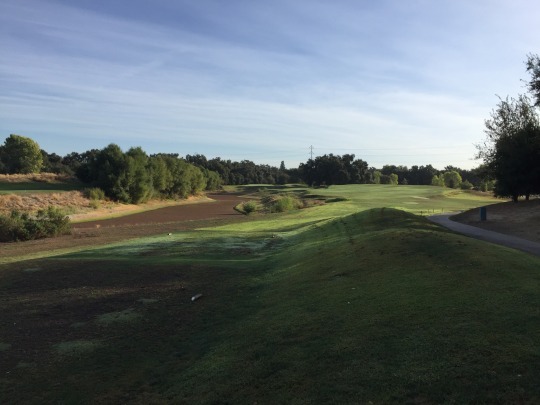 The 8th and 17th both find you hitting over water hazards with elevated tees and greens. We had quite a bit of wind on Tuesday afternoon, which made 8 and 17 especially play very long. 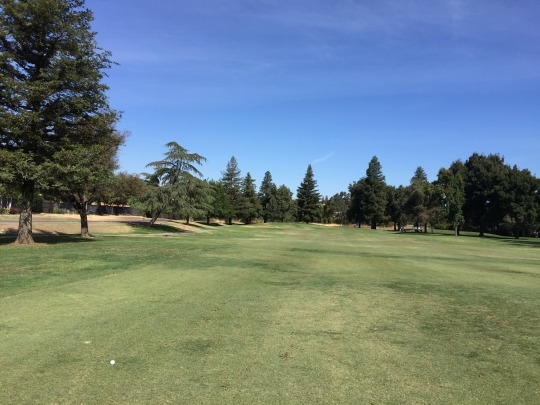 I found myself using a driver on the 168-yard 17th, only to come up about 10 yards short after a solid shot! Mind you, a good drive for me is only 200-210 yards max these days, but that’s still a very stiff wind. 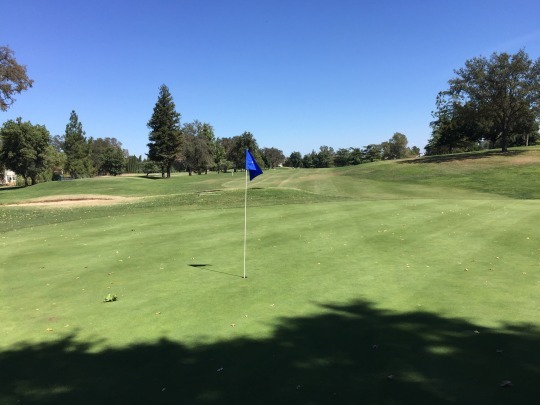 Conditions were very nice overall, and again we had fantastic greens that were receptive and rolling super smooth at medium-fast speeds. 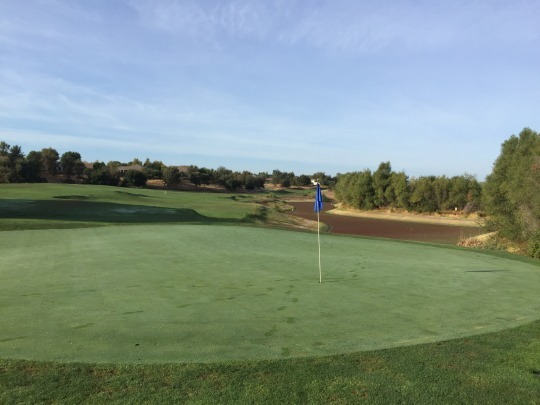 The fairways and rough were all nicely conditioned kikuyu (with the occasional bermuda patch here and there). The bunkers were excellent, as well. There wasn’t anything to knock about the conditions here. The facilities are nice and relaxed, and the staff was great. We felt really welcomed and comfortable as outside guests on a normal day of play. The food was also quite good. 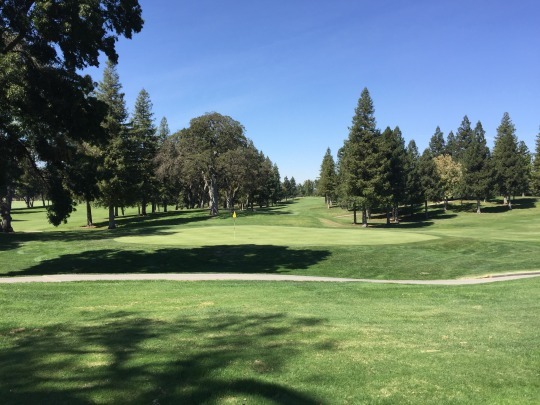 Sierra View isn’t one of Northern California’s more prominent private clubs, but it is well worth playing if you ever have a chance. 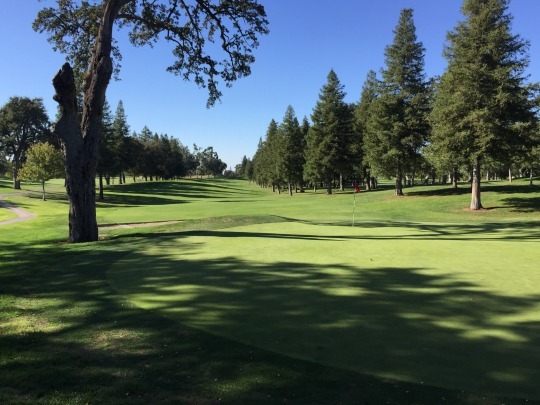 It offers an old school, friendly club vibe with a very enjoyable classic course design. 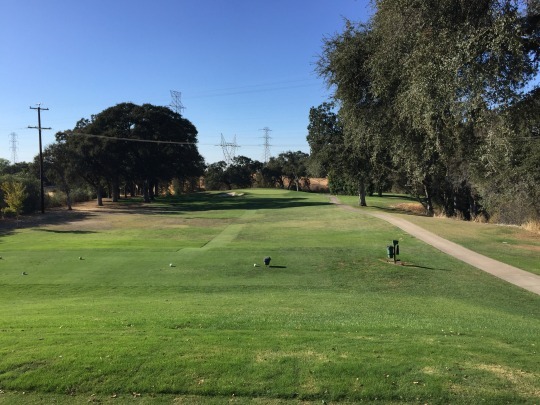 I mentioned in my previous article that my friend and I split up on Monday afternoon because we had different local course collecting priorities. He went off to play Apple Mountain, which is my personal favorite in the Sacramento area and one that I hope to play again someday. However, there are still so many other courses I need to play, which is why I stayed in town and knocked out a few shorties instead. Anyway, in planning for Apple Mountain, he wanted to knock out nearby Camino Heights if he was going to drive out that way. In calling around, he discovered that Camino Heights actually just closed. 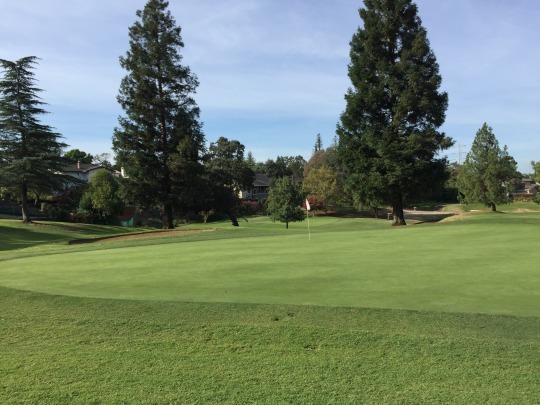 Northern California short courses have been dropping like flies in recent years, which is sad. Every time I plan a trip, I have to update my list and cross off a few more. It turns out that Camino Heights’ last official day in business was Sunday. What a bummer that we just barely missed it. Or did we? Still, he stopped by there after finishing at Apple Mountain to see what it looked like. 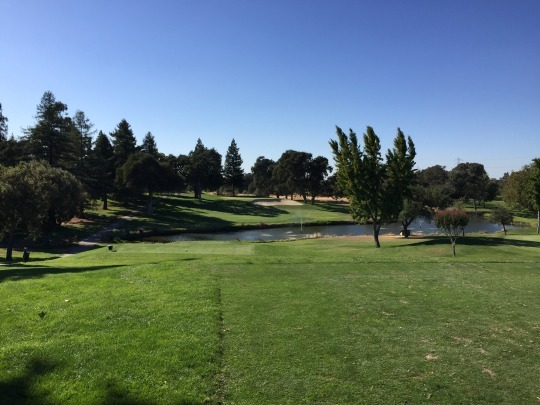 In talking with some residents of the community that he ran into, it turns out that the course did close. 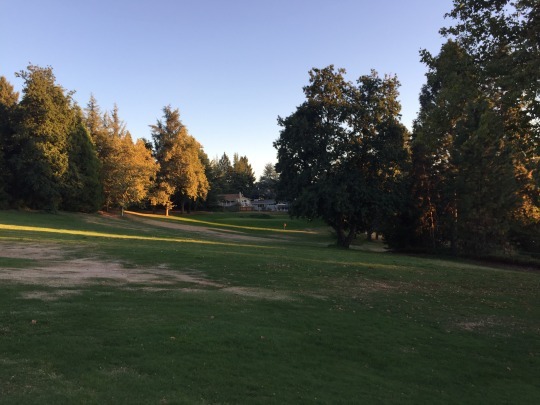 However, a couple other residents just bought it and might have plans to reopen it in the future, perhaps as a private course just for the residents of Camino Heights. 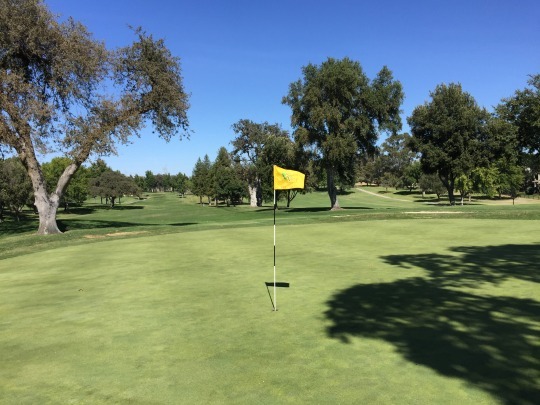 What made things interesting is that the flags were still out on the course and it was accessible for play. The little parking lot and pro shop were completely deserted, but some scorecards were out. Basically, they said it’s just a play-it-as-is-if-you-want situation while the course is essentially in limbo. He was able to play it that evening and I wasn’t going to be outdone. I had to make my way out there on Tuesday evening before heading home, even though it meant getting home after 3:00am instead of around midnight! 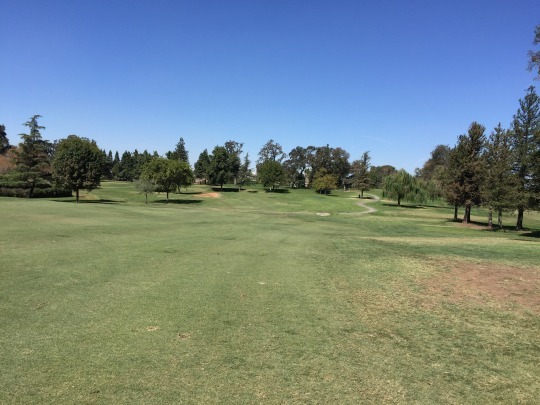 The course was available to play, it was free and its future is very uncertain. It may or may not reopen and it may only be private when it does, so I had better play it while I for sure could. Note: As of October 2018, it appears this course is still closed. Camino is about 45 minutes east of Sacramento on the way to South Lake Tahoe. I was able to take side streets down straight from Roseville, but it is brutal drive in rush hour traffic. It took me over an hour to get down there. 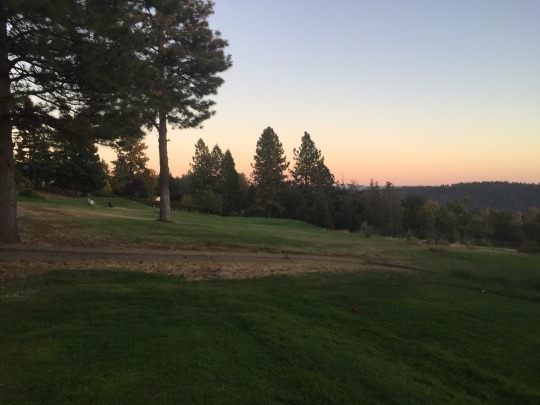 I found the course and finished walking it just before dark. 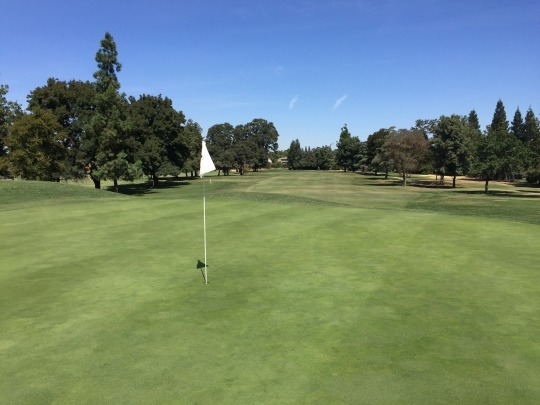 Fortunately, Camino Heights is/was only a 9-hole course with a par of 31. 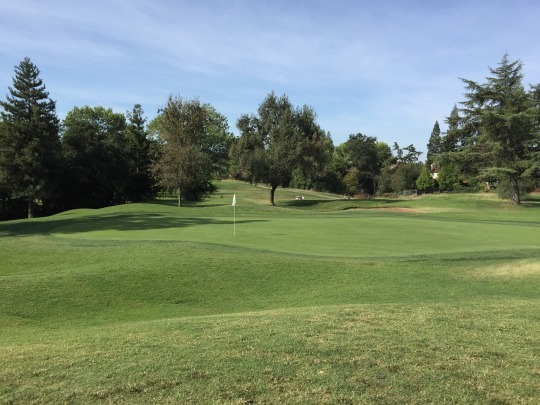 It features four relatively short par-4s mixed with five par-3s of varying lengths. That made it playable with my time constraints. 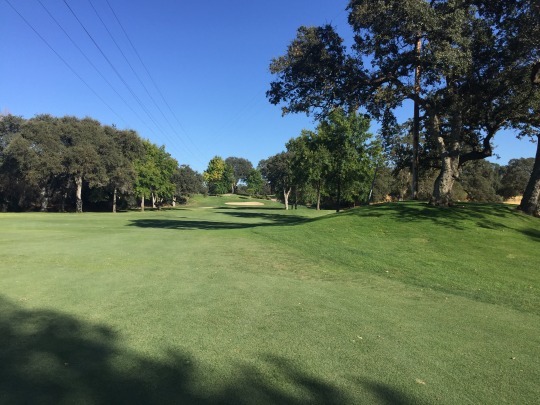 Unfortunately, this is a very hilly course with a sometimes confusing, tangled routing, so it was completely exhausting to walk, carry my full bag and play fast at the end of a grueling golf trip. I survived, though. 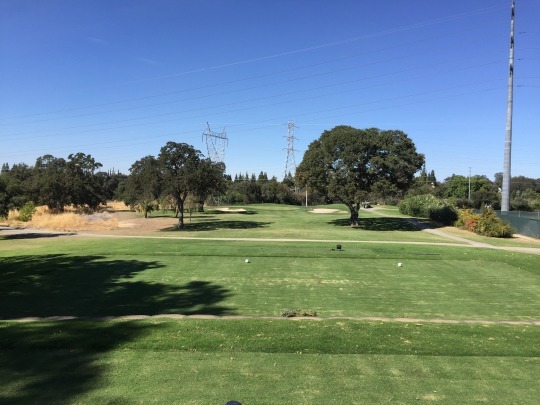 It’s actually a fun little course thanks to the changes in elevation and rural setting. I hope the new owners are able to recover and restore it as much as possible. Otherwise, calling the conditions “as-is” is exactly that. The course just officially closed and you can tell they haven’t been putting in that much effort in its final weeks/months of business. 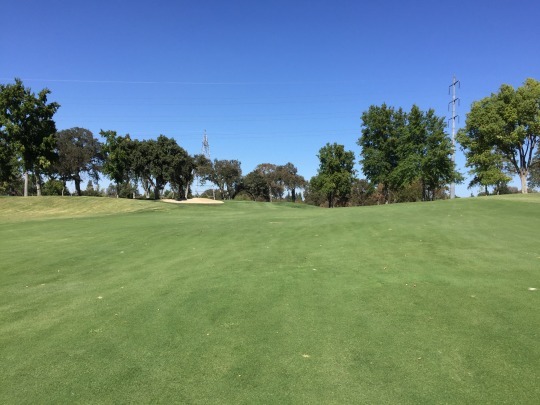 The fairways are super shaggy, lumpy, patchy, etc. The greens are ugly. There was even one temporary green in play. The conditions were not good, and I didn’t expect them to be. It was at least moderately playable, which is all I could hope for in this situation. It was enough to say I officially played the course. I have the scorecard and pictures to prove it! 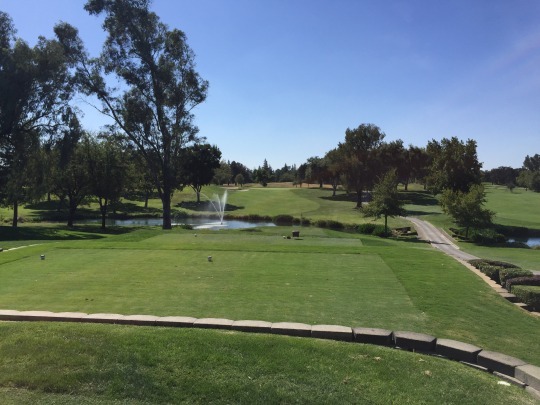 CA, California, Camino, Camino Heights Golf Course, Diamond Oaks Golf Course, El Dorado County, Golf, Golf Course Architecture, Golf Course Photography, Golf Course Photos, Golf Course Reviews, Golf Courses, Jack Fleming, Kyle Phillips, Morgan Creek Golf Club, Norcal, northern california, Placer County, Roseville, Sacramento, Sacramento Golf, Sierra View Country Club, Ted Robinson Sr.